Rooms 2, 90, 92, 94, 96, 98 and 390 are technology rooms (include computers). 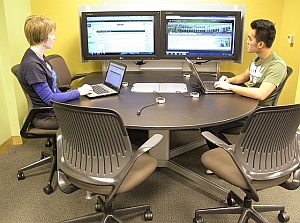 Each has a standard lab computer, 47-65″ widescreen monitor, and connections for laptops or other devices for collaboration. Room 390 has a 65″ touchscreen monitor and digital whiteboard. Stop by the 3rd floor flexible study touch-screen equipped study booths. Borrow a Laptop, pocket-sized projector and study room key at the 1st floor Circulation desk to make any study room into a collaborative space. Visit the Sandbox Collaborative Study Area, Practice Presentation Rooms, or learn about Video Viewing.